Four to six hens are crowded into each cage. They are unable to stretch their wings or even lie down comfortably. Hens have strong instincts to build a nest in which to lay her eggs, to dust-bathe and perch. 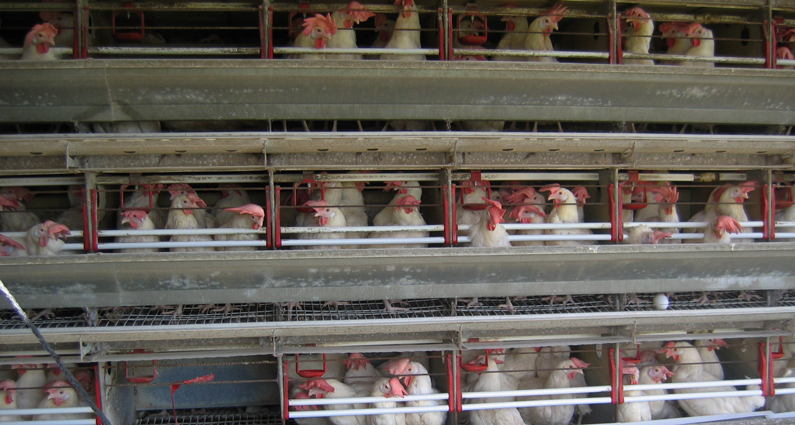 None of these natural behaviors are possible on egg farms. In the cages, hens suffer from foot and leg deformities, and feather loss from constantly rubbing against the wire. In an attempt to reduce pecking and injuries— problems resulting from overcrowding— part of hens’ beaks are sometimes severed at the tip using a hot blade, without the use of anesthesia. “Debeaking” is an extremely painful but standard poultry industry practice. Although chickens can live to be over 10 years old, in egg farms they rarely see their second birthday. 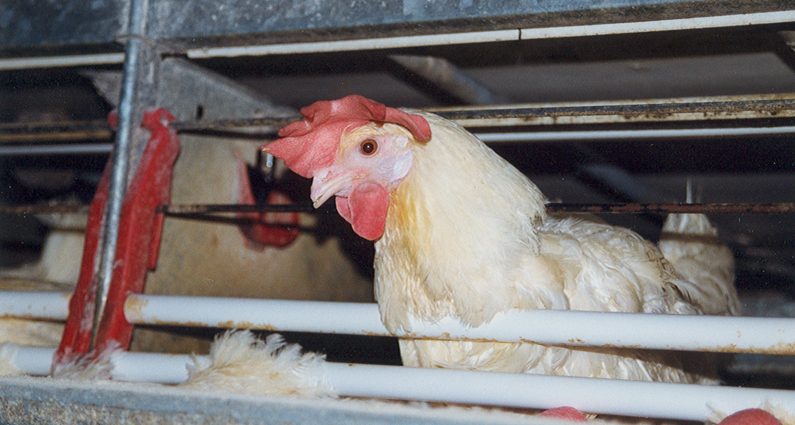 When a hen is no longer producing a sufficient number of eggs, she will be sent to slaughter. Many never make it, and die in the cage from heat stress, disease or injuries. Another problem inherent in egg production is the disposal of unwanted male chicks at the hatchery. Male chicks have no value to egg farmers, so they are killed as cheaply as possible; they may be thrown into trash cans to slowly suffocate, or ground up alive. The intensive confinement of hens in battery cages has been recognized as inhumane in many countries. Germany, Switzerland, Sweden and Austria have banned battery cages. The entire European Union phased-out cages in 2012. What About “Cage Free” or “Free Range” Eggs? “Cage free” eggs come from hens who are not confined to cages (instead, the birds are kept inside crowded sheds). They can spread their wings, walk and engage in some natural behaviors. “Free range” hens, in addition to not being confined to cages, are allowed limited access to the outdoors. Unfortunately, debeaking is allowed under these standards. At the end of a year or two, when their egg production declines, “cage free” and “free range” hens are hauled to slaughter along with battery-caged hens. The commercial production of eggs, milk and other animal products can never be cruelty-free. But animal-welfare campaigns, such as efforts to end the use of battery cages, have improved the lives of millions of animals and increased public awareness about animals. Don’t buy eggs. Adopting a vegan diet, one free of animal products, is the most important thing you can do to stop the suffering of chickens. The Florida cities of Hollywood, New Port Richey, West Palm Beach and Winter Springs have passed resolutions condemning “battery cage egg production, based on the inherent cruelty of confining egg-laying hens in battery cages.” Approach your local government leaders and ask them to consider a resolution opposing the cruelty of cage egg production and/or other factory farm abuses.